Who is impacted by SWAT raids? 100 SWAT raids per day disproportionately affecting Black, indigenous + Latinx communities and poor folks, particularly homeless folks. The American Civil Liberties Union concluded in a recent study of 20 cities that 42 percent of those subjected to SWAT search warrant raids were black and 12 percent Hispanic. Of the 81 civilian deaths tallied by The Times, half were members of minority groups. Because racist + classist policing institutions are increasingly empowered everyday. Because policing and militarism continue to overlap more and more, connecting domestically and internationally. Because many raids occur in low-income neighborhoods, shooting deaths like one in November of a 22-year-old black man in Salisbury, N.C., have exacerbated racial tensions already raw from a spate of high-profile police killings. The American Civil Liberties Union concluded in a recent study of 20 cities that 42 percent of those subjected to SWAT search warrant raids were black and 12 percent Hispanic. Of the 81 civilian deaths tallied by The Times, half were members of minority groups. In the United States, according to the Bureau of Justice Statistics, Black people are arrested at about double the rate of white people and at a proportionally higher rate than any other racial group. As the foot soldiers of the notoriously racist "war on drugs," SWAT teams have historically brought a war-making mentality to the daily practice of policing and arrest. The state profiled Black and Latino men as the primary targets for this war, and the police trained to carry the war out and treat them as threats to be neutralized. However, those impacted by SWAT raiding of targets, such as children and families, are voices often unheard. SWAT teams are deployed nearly 50,000 times per year, and according to The Economist, "Roughly 90% of all police departments in cities with populations over 50,000 have a variation of a SWAT team, as do federal departments including the Department of Agriculture and the Department of Education. Given the frequency with which SWAT is employed by law enforcements, we can see that SWAT isn't so much specialized policing as the mainstay these days." Maria Calvillo, a 13-year-old member of Xicana Moratorium Coalition (XMC), speaking at a September 11 Stop Urban Shield rally in Oakland, described her home being raided by SWAT in the middle of the night while she was home with her mother and baby sister. 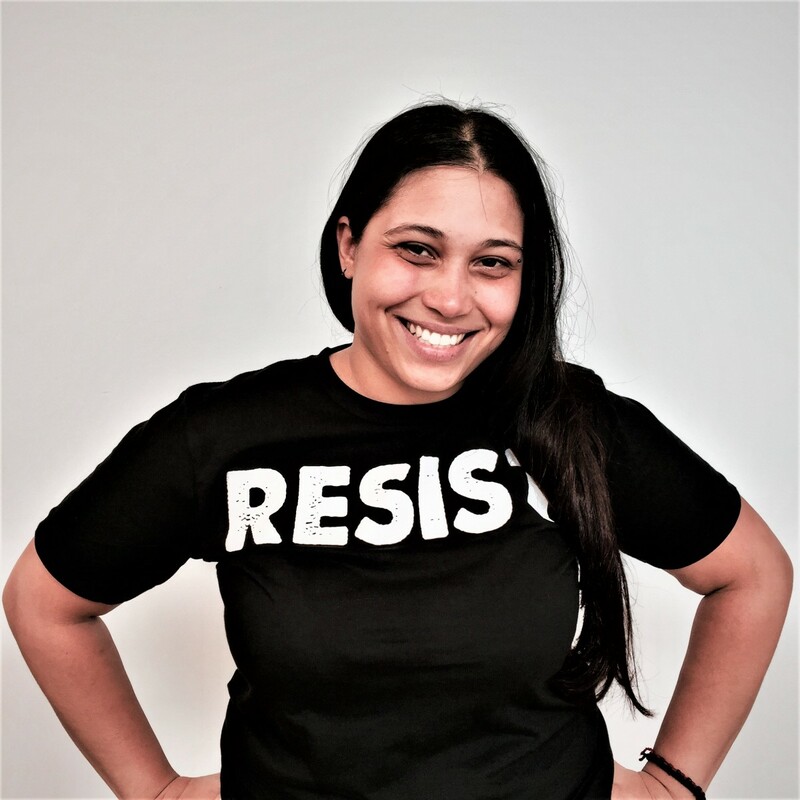 "As soon as I hit the door, I opened it and they started screaming at me, tell me to put my hands up, pointing rifles at me," she told Truthout. "I looked around, and it seemed like a movie, I couldn't believe it.... The police had a tank in front of our house. An actual tank." "If we push Urban Shield, a product of the global war on terror, out of the US, we delegitimize the US war machine at its core." The murder of Aiyana Jones, a 7-year-old girl who was shot in a Detroit no-knock SWAT raid in 2010 after a flash grenade was thrown through the front window, made abundantly clear how war mentalities are enacted through SWAT killings. SWAT teams are deployed nearly 50,000 times per year. According to The Economist, "Roughly 90% of all police departments in cities with populations over 50,000 have a variation of a SWAT team, as do federal departments including the Department of Agriculture and the Department of Education. Given the frequency with which SWAT is employed by law enforcements, we can see that SWAT isn't so much specialized policing as the mainstay these days." According to the American Civil Liberties Union (ACLU), 39 percent of people impacted by SWAT deployments are Black versus 20 percent for white people (Black people make up about 13 percent of the US population and white people about 63 percent). SWAT-style teams (sometimes named "counterterrorism" or "strategic response") are also frequently deployed to suppress protests and political dissent. Recent examples from Occupy and the Black protest movement provide clear demonstrations of how quickly policing tactics escalate through militarism, regardless of the types of cops on the streets. For anyone engaged in direct action and civil disobedience, and in particular for policed peoples, the danger of interaction with police deployed to suppress dissent should not be underestimated. SWAT raids heavily target people with disabilities and in mental health crisis. Disability Rights group Ruderman Family Foundation released the frightening statistic that "disabled individuals make up a third to a half of all people killed by law enforcement officers", and the Guardian reports that at least 246 people were killed by U.S. people in 2015 with mental health issues. 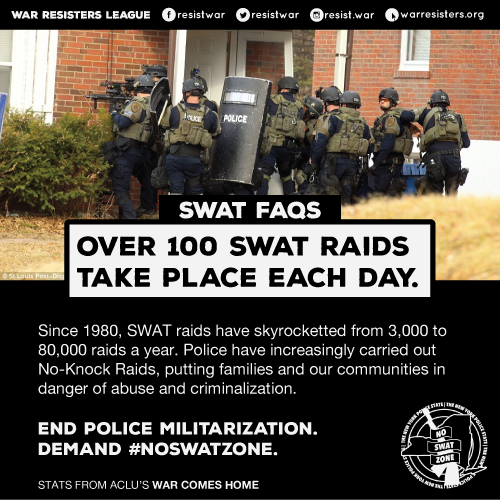 The increase in number of SWAT raids is not subtle: While SWAT raids were estimated at 8 per day in 1980, today there are approximately 137 SWAT raids a day. Today, almost every police agency with at least 100 officers, and about a third of all smaller ones, either has its own full-time unit or participates in a part-time or multijurisdictional team. 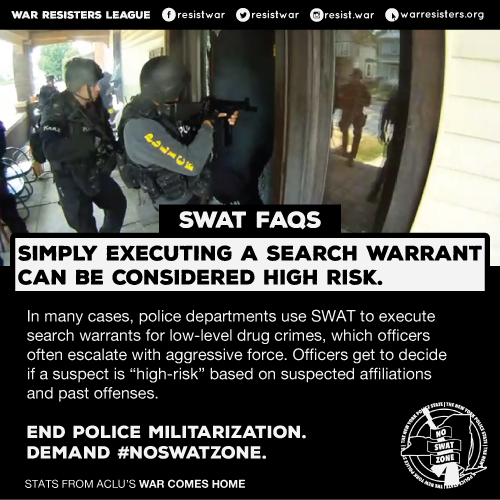 The ACLU’s War Comes Report found that 79% of incidents involving a SWAT team were to search a person's home, and 60% involved searches for drugs: essentially, amounts to use of paramilitary tactics to conduct domestic criminal investigations in people’s home. SWAT trainings and weapons conventions happen 365 days a year, all over the world, as a growing national, regional and international phenomenon. In the US, they are where the arms industry meets law enforcement and emergency response agencies, where they host demagogue keynote speakers and often racist and Islamophobic training scenarios highlighting escalated police tactics, with the federal government footing much of the bill. Events range in size from locally focused events such as NYTOAC: New York Tactical Officers Association Conference (which though limited to members from across NY state proudly frames itself as 'national') to the crown-jewel type events like Urban Shield, what many consider the largest SWAT training in the world. 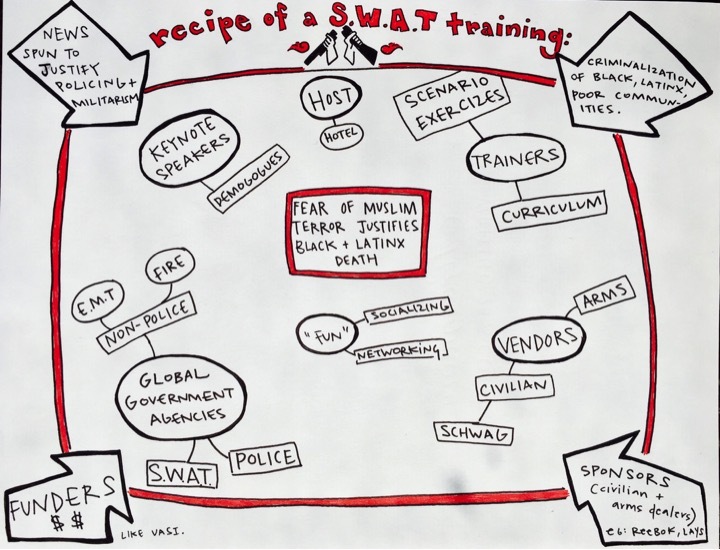 THE RECIPE OF A SWAT TRAINING: SWAT trainings and weapons expos commonly follow the same playbook featuring key elements: weapons vendors, police and non-police government agencies from around the world, as well as local, state, regional and federal agents, trainers (with their curriculum), advertisers, civilian companies, ideological speakers, police and non-police government agencies from around the world, demagogue keynote speakers, and then more rarely, data experts and civilian games, and most ominously first-responders and emergency medical technicians/fire - department. Additionally, a much ignored aspect is the entertaining and socializing that occurs at SWAT trainings, whether it be raffles, BBQs and pig-roasts (no joke), parties, or other networking events. Finally, trainings are often documented by internal media, through video, photos, and then distributed through magazines and social media.